Lithium battery power is the foundation that underpins the entire vision of efficient, pollution-free personal and urban mobility. Along with increasingly more efficient and less costly permanent magnet motors, the potential for transforming the mobility market is as great as what occurred at the turn of the 20th century with the introduction of the internal combustion engine. Those participating in the formative stages of this transportation revolution will include the leading edge efforts of established industry participants, as well as start-ups that have developed advanced engineering technology. The format for this rapidly evolving industrial and market can be seen in what is presently transpiring in the development of solid state lithium batteries. Small Vehicle Resource, LLC, in its’ ninth biennial report on the small, task-oriented industry, provides a well-documented strategic picture of what is now happening with small vehicles in the forefront of urban and personal mobility, as well as a strategic vision of benchmark developments over the next five to seven years. 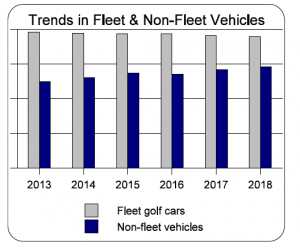 The report includes the latest detailed trend and outlook data that has defined earlier reports–that is, the markets for fleet golf cars, personal transportation vehicles, light duty utility vehicles, and the off-road market. Covering trends since 2013 and forecasts to 2023, the report contains a full update of trend and forecast data in over 50 individual tables and charts, which accompany an in-depth analyses of products and market segments. Transitioning from lead acid to lithium batteries, raising performance and transforming vehicle longevity and recycling value. This report, the latest in the series, dating to 2000, develops the past five year market trends from 2013 to 2017, with estimates for 2018 and projections to 2023. The key segments are golf fleet, personal transportation vehicles (PTVs), light-duty utility vehicles, and off-road work and recreation vehicles. Overall, the market, with the exception of the golf fleet segment, should see steady growth and provide the opportunity for a major repositioning during the next five years. The repositioning will, through on-going product development, an evolution in urban and suburban transportation systems, and a new strategic focus, set the stage for a significantly broader market in the post 2023 period. The PTV market continues to separate itself from the golf fleet vehicles, both in terms of product development and internal company marketing and sales organization. 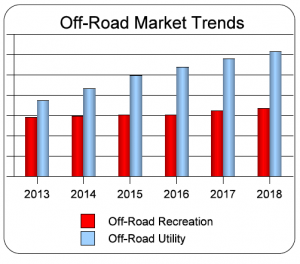 Light-duty utility vehicles (LUDs), oriented primarily to the commercial channel, will also advance in the market, continuing the upswing experienced in the trend period. As the ORV market matures, growth rates decline, and company performance becomes more and more dependent on achieving market share and realizing operational cost savings. Despite lower expected growth, this industry segment continues to attract new companies, adding to the competitive intensity of the market. The SVR report contains the latest market share numbers and a detailed, critical analysis of company strategies, and who is likely to come out on top. Order before May 5 and receive the full package for the price of the industry report alone: $3,250.